Major global airlines, including Gulf carriers, are keen to invest in this space. Major airlines from the Gulf countries have shown an interest to invest in India’s regional aviation market. This coincides with the government announcing a new policy to kickstart regional airlines in the country through sops and subsidies. Minister of State for Civil Aviation Jayant Sinha told Business Standard that many foreign airlines, including major carriers from West Asia, have held negotiations with the government to fly on regional routes connecting the country’s major cities to tier-II and tier-III cities. “We have had large airlines like IndiGo, SpiceJet, Jet Airways expressing interest. Then we have people in the UK and the US engaged in regional aviation showing interest… some large global airlines from the Gulf have expressed interest to run regional airlines in India,” Jayant Sinha said in an interview. He, however, declined to name the airlines. The investment could be in the form of a stake in an existing airline or opening a new regional airline in the country. “With the recent changes in FDI (foreign direct investment) rules, India now has liberal and open policy in the world. Naturally, they will be interested,” the minister said. In June, the government increased the FDI limit in domestic airlines to 100 per cent. But FDI is on automatic route only up to 49 per cent. The rules, however, state that the principal place of business must be in India. According to industry sources, India being a significant market for the Gulf majors, they would want to have a feeder airline, which brings West Asia-bound traffic from tier-II and tier-III cities to the metro airports. “A significant traffic to the Gulf comes from the smaller cities. Take, for instance, passengers from Chandigarh, who, until recently, had to fly to Delhi to take flights abroad. Similarly, there are cities like Indore, Vizag and Surat, which feed to the Gulf traffic. Having a joint venture with a regional carrier like Air Costa or TrueJet can be captured as a thoroughfare product,” explained an executive of a major domestic carrier. Over the past few years, the three major Gulf carriers -- Emirates, Etihad and Qatar -- have taken up a bulk share of the international traffic of India. Etihad, Emirates and Qatar Airways did not respond to queries on the subject. Abu Dhabi-based Etihad, which owns 24 per cent of Indian carrier Jet Airways, became the first foreign airline in 2013 to invest in an Indian carrier. Qatar Airways’ chief executive officer (CEO) Akbar Al Baker said in March that the airline was willing to pick up a stake in IndiGo. Experts warned that the investment makes sense for the Gulf carriers, but they might face opposition from Indian carriers. “India is a key market for Arab airlines, not just because of the big population that is employed with Gulf countries but also due to international traffic that connects via hubs like Dubai, Doha and Abu Dhabi. While the plan proposed by the Gulf carriers looks good, the litmus test is whether the government will allow this to happen and whether opposition from the likes of Air India and others will thwart this idea,” said Saj Ahmad, chief analyst, StrategicAero Research. Some analysts were of the view the investment proposal should not be linked to enhanced bilateral entitlements because that might hurt the Indian carrier. “As long as the interest to invest is on merit and not bilateral enhancements, it should be welcome. Capacity enhancement is a core issue for those carriers and needs to be dealt with, based on India’s connectivity needs,” said Kapil Kaul, CEO South Asia at Sydney-based consultant CAPA-Centre for Aviation. 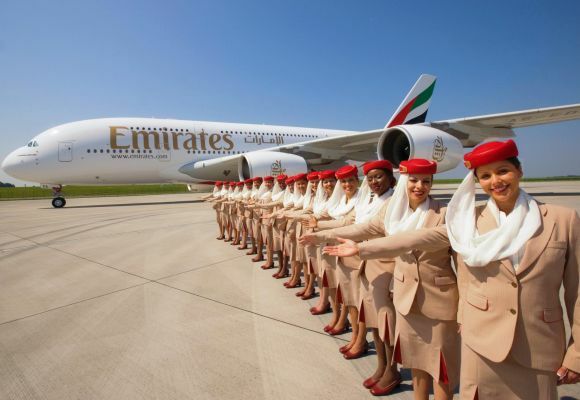 Image: Emirates Airline crew. Photograph: Reuters.